To secure the preservation, protection, development and improvement of features of historic or public interest in the area, the Society keeps abreast of local developments and responds to issues as they arise. It monitors the activities of local government and other organisations and takes positive action to consult and lobby where necessary. Our current priorities can be seen in more detail on the Current Issues page. The Society endeavours to promote high standards of planning and building in or affecting the area. At its monthly meeting, the Committee monitors all Planning Applications, following up recommendations with Planning Officers and attending Planning Appeals and other meetings. Our Planning page gives more detail and links to the South Hams District Council’s Planning Department. These activities require interaction with other organisations, so the Society maintains close contact with others vitally concerned with the area. Links to their websites can be found in the side bar. Each year, the society makes donations to support the projects of other local organisations working to enhance the area in different ways. 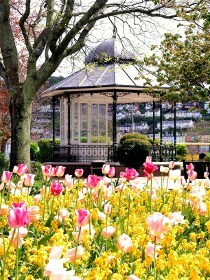 Beneficiaries range from Dartmouth in Bloom, to conservation work on St Clement’s Church, to the establishment of an RNLI inshore lifeboat station in Dartmouth. More information about our donations can be found here. The Society has always provided a range of enjoyable activities aimed at raising public awareness about the geography, history, natural history and architecture of the area. Our Programme gives more details of the activities organised for the current year. Ensuring that all these aims are covered requires thought, discussion and preparation. The work falls largely to the Society’s Committee. It is led by a Chairman and usually numbers about a dozen people representing as far as possible each of the communities in the Society’s area of concern. The Committee meets monthly, usually on the last Tuesday evening, and addresses an agenda that covers the full range of the Society’s interests. The Constitution and current Officers and Committee can be seen in the linked pages.